Simon Kirke (legendary drummer of Free & Bad Company), Sal Maida (Roxy Music, Cracker) Chris Flynn (Rogue’s March), Mark Bosch (Ian Hunter Band), Kenny Margolis (Mink Deville, Rogue’s March), Deni Bonet (REM, Cyndi Lauper) & more t.b.a. …and an all-star cast of guest performers. 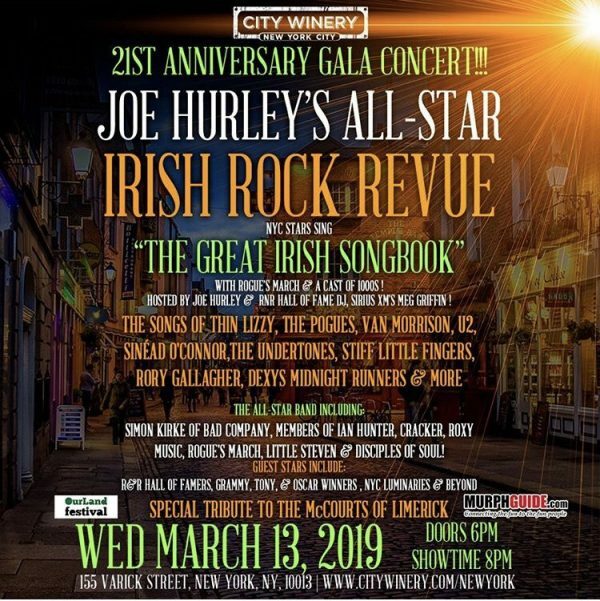 Ricky Byrd (R&R Hall Of Fame Inductee from Joan Jett & the Blackhearts), LaLa Brooks (The Crystals), Carleton Jumel Smith, Tony Shanahan (Patti Smith band), Ivan Julian (the Voivoids), Malachy McCourt, Erikka Walsh (“Once” on Broadway), Mary Lee Kortes, Sherryl Marshall, Tricia Scotti, Tammy Fay Starlight, saxophonist Stan Harrison, Laura Cantrell, Ellen Foley, Garland Jeffries, John S. Hall (King Missile), Tony Garnier, Don Fleming, Roger Clark (NY-1 News), Pat Robinson (The Itinerants), Jesse Bates (Los Dudes), Kia Warren, Al Landess, Mike Fornatale, Eamonn Bowles, Tony Zajkowski, Paul Hurley, Paddy McCarthy, Ryan McCurdy, Walker Hornung, Oneman Elbows and many more stars t.b.a.